College can be the best of times. It can be the worst of times. It's often a lot of in between. Transitioning into full adulthood is exciting, but it's also fraught with all kinds of anxieties. 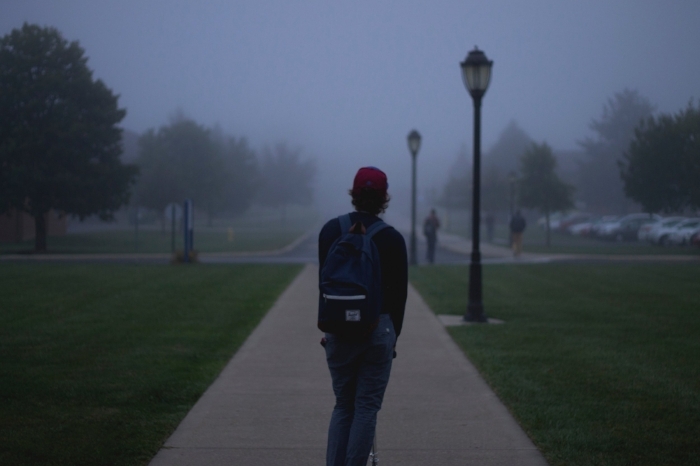 As a Christian college student, how do you navigate these years with joy? The love of God for you is full and complete. Whether you're far from home, or commuting every morning, Christ goes with you. When you get stellar grades, and also when you're only passing because your professor grades on a curve, you are loved. If you're growing in your faith day by day, or you're all tangled up in doubts and dead end decisions, Jesus remains "the same yesterday, today, and forever" (Heb. 13:8). I can't imagine a Sunday without church. (You're thinking, he's a pastor, of course he's gonna say that). But seriously. And here's why. Lots of things change in our lives. We have ups. We have downs. We live in the blur of moments where we're just trying to do our best and make it to the next thing on our to-do list. But when I worship, my life is marked by a pattern of stability. Everything else could be uncertain, but Christ is solid. The word, the body, the blood, the fellowship - I'm refocused on the reality of who I really am - loved in Christ. I can't think of a time in life when you need worship more than college. Find a church that loves Jesus and teaches the Word of God faithfully. By going Sunday after Sunday, your soul will find rest from the demands of your classwork. Worship is the one place where you don't have to be successful, you don't have to perform, you simply come to receive love and give love - like breathing in and out. Ideally, you'll also find connections with people outside of the college echo chamber - moms and dads with runny-nosed toddlers climbing pews, and elderly folks with wisdom beyond the latest academic trends. You'll be all the richer because of them, and they will also because of you. One of the discouraging things about the current college scene is how intellectually insulated many campuses have become. Academic institutions have a bad habit of getting infected with the latest trends in thinking, so much so that everything gets interpreted through a narrow lens of the latest intellectual fad. For example, if you were a university student in past centuries, Kant or Hegel or Freud would have been all the rage, and you wouldn't really be anybody unless you jumped on the philosophical bandwagon. What's interesting is that these ideas had their day, and now they don't carry much weight. Could it be that the ideas taught by your professor will be old news in a few decades - perhaps even significantly adjusted or debunked? So, with that said, strive to question the assumptions behind what everyone assumes to be true on your campus. Always ask the uncomfortable "why" and "what for" questions that no one really wants to wrestle with. Does this mean you should question your Christian faith? Well, I like to check under the hood of my car before I take it on a long road trip. I've done the same with my Christian faith, and the more I look into it, the more I see how well the engine runs. We shouldn't fear examining truth, because if something is true it will speak for itself and withstand scrutiny. The Christian worldview provides beautiful, intellectually satisfying answers to the questions you'll face in college. Your Christian faith is part of a deep and profound intellectual tradition that draws all of the disciplines you study into a coherent, meaningful whole. Can you say the same if you look under the hood of atheism, secularism, and other worldview options out there? There's a good chance that what you have set your heart on your freshman year will not be a reality after graduation. You could change majors. You may run out of money and need to take a few semesters off. You may get to the end of your senior year and realize you have no desire to teach elementary school. You could get a degree in a field that has little job openings, or that simply doesn't pay the bills. Don't despair. Life is always more messy than we plan it to be. Regardless of whether you achieve your dream career or pursue a series of dead ends, what matters as a Christian is not so much what you do, but how you do it. "And whatever you do, in word or deed, do everything in the name of the Lord Jesus Christ, giving thanks to God the Father through him" (Col. 3:17). Your worth is not rooted in your school or career success. Your worth is firmly grounded in Jesus. So don't worry if it doesn't all work out. True success is when we serve others in whatever place God has placed us, whether it be a high or low one. God's world is held together by lots and lots of small actions in the right direction. If no one milked the cows, harvested the wheat, clocked in at the factory, or drove the truck to the grocery store, I would not have enjoyed my bowl of cereal this morning. What we do matters. As a Christian, what you will do in the future matters. The classes you're taking that seem so pointless and hard to pass are all ways of glorifying God and serving your neighbor. Work hard as a college student knowing that God is using it. Luther once said that we are all masks of God. He serves the world through us as his instruments. As a student and someday employee or employer, God is and will be at work in you, serving the world. That's a high calling, whether you're making an Americano at Starbucks or studying marine biology in Belize, it's all for God's glory and the good of your neighbor. I'm going to say it one more time because we easily forget it - you are loved. God has shown his love for you in Christ once and for all. It's final and finished. Nothing can separate you from the love of God in Christ. No mistake you make can erase his compassion for you. No dark period of doubt can lessen his affection for you. So, whether you succeed or fail, find your way clearly or flounder, know that his love for you will not change.